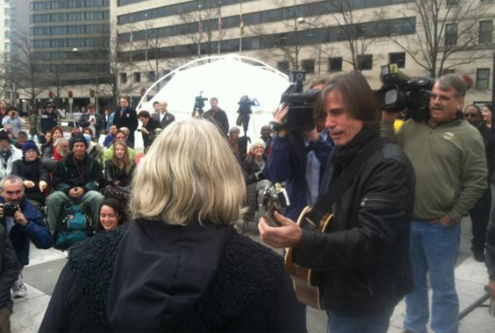 Famed folk singer/songwriter Jackson Browne performed at Freedom Plaza Monday to show support for Occupy D.C.
WASHINGTON – Famed folk singer/songwriter Jackson Browne performed at Freedom Plaza Monday to show support for Occupy D.C.
Browne told reporters he was there in “order to express his solidarity” with the movement. “When people stand up for what you believe in, it’s a good idea to stand with them, and let them know they’re not alone,” Browne says. Browne recently performed with a number of musicians at Zucotti Park to show his support to those part of Occupy Wall Street. The folk singer performed a song he has written for the movement, which he considers a “rallying cry” for people protesting in encampments across the country. Browne, a member of the Rock and Roll Hall of Fame, will be featured on “Occupy This Album,” a compilation album that will contribute to the Occupy cause. Mark Segraves contributed to this report. Follow “>WTOP on Twitter.